Corn sprouting in the black peat soils of Westhay Moor, south of Wedmore, on the Somerset Levels; 3 June 2016. 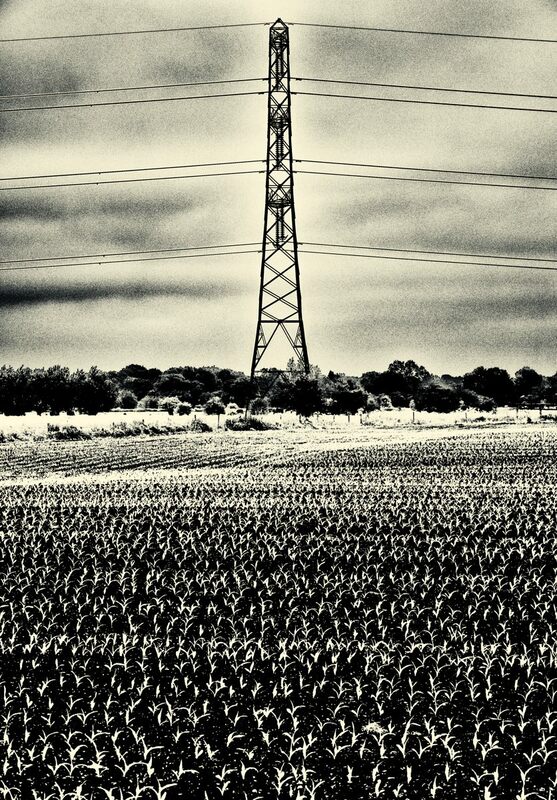 There is another “pylon-scape” here. Technique: X-T1 with 55-200 Fujinon lens at 113mm (equiv); 3200 ISO; Silver Efex Pro 2. 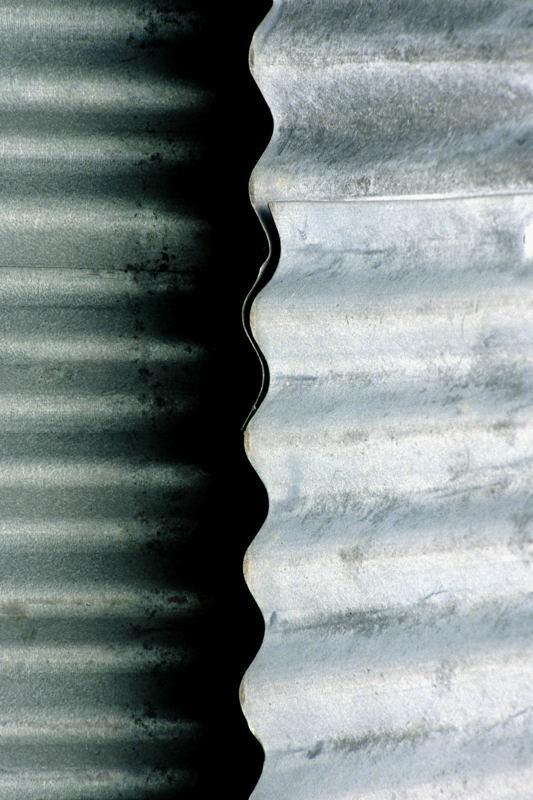 Corrugated iron shed (its roof on the right) at the former Willows Garden Centre, near Westhay, on the Somerset Levels; 15 Jul 2005. Minimal colour, not far from monochrome. Technique: F6 with 80-400 Nikkor lens at 400mm; Fuji Provia 400 colour slide rated at 400 ISO; image rotated 90 degrees clockwise. 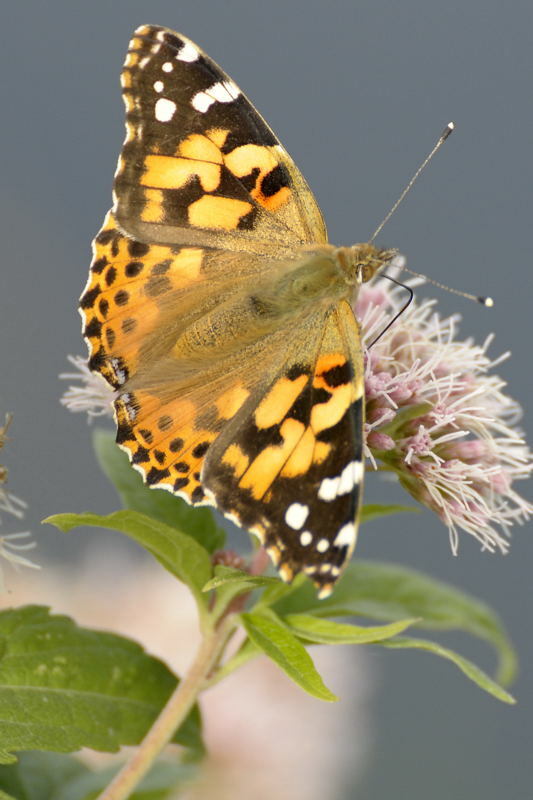 Painted Lady butterfly beside the South Drain, on Shapwick Heath, south of Westhay, on the Somerset Levels; 26 Oct 2009. Technique: D700 with 70-300 Nikkor lens at 300mm; 800 ISO. An absolutely beautiful and highly informative book which I recommend to anyone interested in butterflies and/or wildlife art is The Butterflies of Britain & Ireland, by Jeremy Thomas (a butterfly specialist) and Richard Lewington ( a very skilled artist); 1991; ISBN 0-86318-591-6 – highly recommended. From this book I learn that this species is probably not permanently resident in any part of Europe, because it does not hibernate and its caterpillars perish at any temperature below 5 degrees C. Instead, the Painted Ladies that we often see in parks and gardens and in the countryside have probably bred around desert edges in Africa and Arabia, and then moved north up into Europe in huge numbers – something which I find impressive. 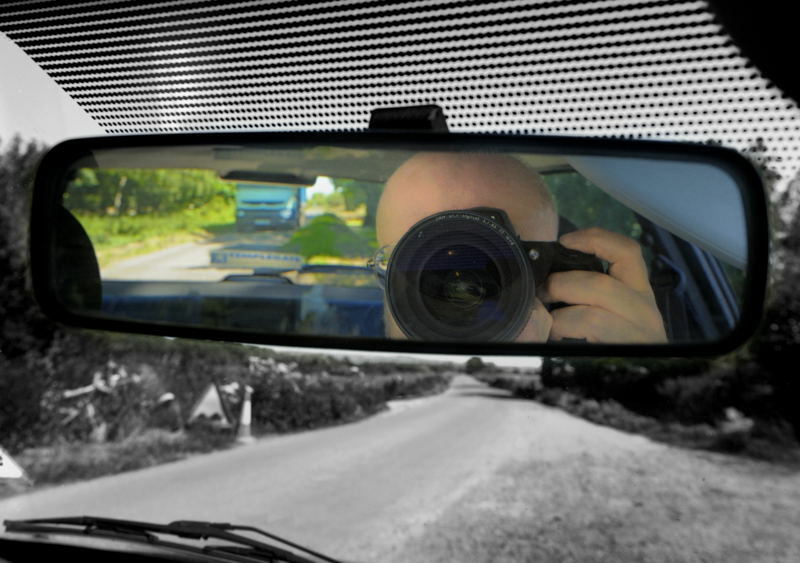 Self-portrait with blue lorry, near Peacock Farm, Westhay Moor, on the Somerset Levels; 24 Jul 2012. I’m sitting very upright in the driving seat of my car, using a wideangle zoom to record both the scene in the rear view mirror, and the road ahead as seen through the windscreen. Back home, I’ve converted the shot to mono using Capture NX2, but retained original colour – and added some brightness too – for the scene in the mirror. The rows of small dots above the mirror are a device to help prevent dazzle when looking up at the mirror. Click onto the image to open a (slightly) larger version in a separate window. Technique: D700 with 16-35 Nikkor lens at 24mm; 800 ISO; manipulated with Capture NX2. Red Ruby Devon cow on Peacock Farm, northeast of Westhay, on the the Somerset Levels; 21 Mar 2012. A wild face, and one giving the impression of great power and strength. I am a great fan of The Lord of the Rings, and of Dark Age myths and history generally – so, thinking of the great Beowulf story, could this be the monster Grendel? 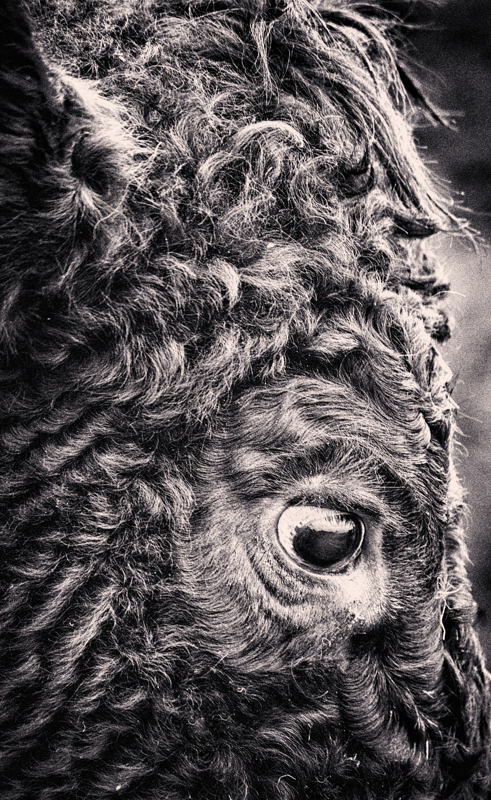 Technique: close in with a long (x8 magnification), handheld telephoto, to fill the frame with just a part of the animal. Technique: D700 with 80-400 Nikkor at 400mm; 3200 ISO; converted to mono, and toned, with Silver Efex Pro 2. Cow and her calf, Peacock Farm, Westhay Moor; 3 June 2016. 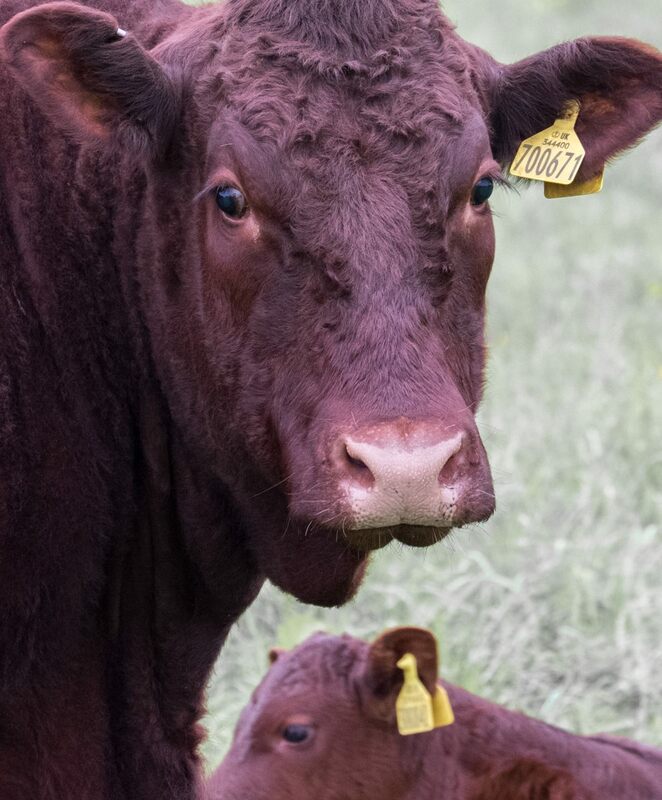 Ruby Red Devon cattle, always to be seen – and certainly a pleasure to see them – around this farm. And a mother’s concerned look, interrogative, not unduly concerned but still wondering what the fat guy with the camera is all about. She’s not the first to wonder that. Corn sprouting in the black peat soils of Westhay Moor, south of Wedmore; 3 June 2016. X-T1 with 55-200 Fujinon at 113mm (equiv); 3200 ISO; Silver Efex Pro 2. Westhay Moor, northwest of Lower Godney; 29 April 2016. Click onto the image to see a larger version in a separate window – recommended. Previous images in this series can be found here, here and here. D800 with 70-300 Nikkor at 300mm; 1600 ISO; Silver Efex Pro 2, starting at the High Structure Harsh preset and adding a cyantotype tone; Color Efex Pro 4. Westhay Moor; 14 Sept 2015. Particularly as my years accumulate, there are times when I’m immensely grateful for the shelter afforded by a car – and this was on of those times. 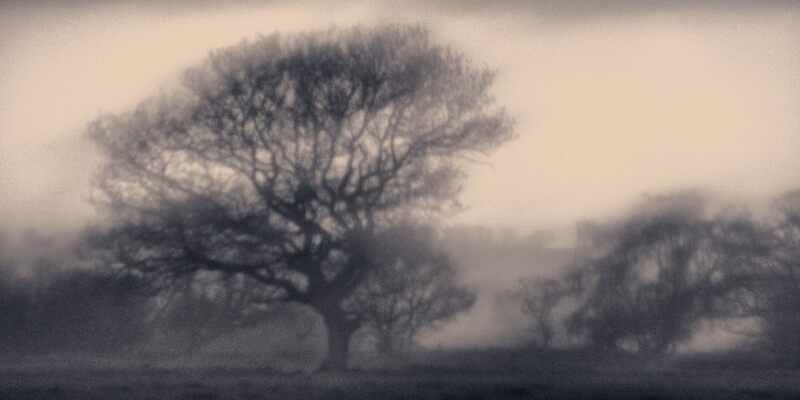 Early morning, and as I pushed on westwards across Westhay Moor, the skies opened. The road was soon awash, and all of my car’s windows were firmly closed. Then a large tractor loomed inexorably at me out of the murk and, on the single track highway, there was no alternative but to try and get my smaller car off the road – and I ended up on (thankfully!) firmish ground beside the gateway to a field. The tractor rumbled by and, as usual, the ground all around shook like a jelly from the shock of its weight – the roads and indeed the ground around here have few foundations, for 60 or more feet below the surface of the ground there is only wet peat and clay. 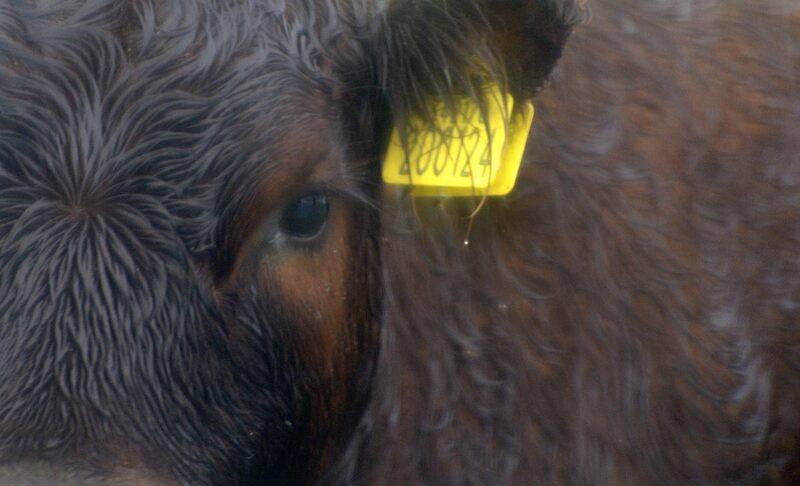 I made to pull back onto the road again but glanced left as I did so – and found myself looking into this face, that was peering out at me through the gate’s bars. The rain was still sheeting down, the car windows were running with water and so was he. I felt for him, I have to say, I was so glad to be dry. And I lifted the camera off the passenger seat, cranked up the ISO and, with little hope of success, took his picture. Top quality it certainly isn’t, but maybe it gives a feel for the moment. D700 with 70-300 Nikkor at 300mm; 3200 ISO; Color Efex Pro 4. Concrete blocks – aka breezeblocks – piled up in the sun, at the former Willows Garden Centre, near Westhay, on the Somerset Levels; 19 Sept 2004. 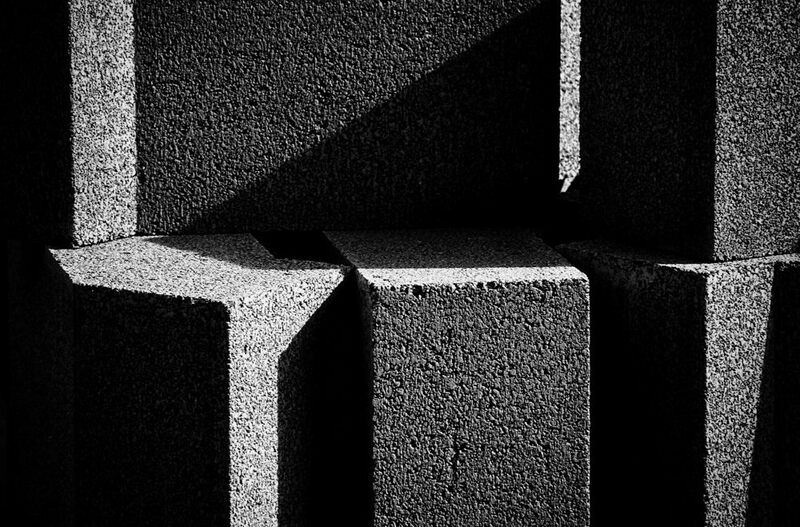 Simple interplay of form, texture and light / shadow. Long ago, well a decade anyway, I used to really enjoy using Agfa Scala black and white slide film. It had a nominal speed of 400 ISO if I remember correctly, but could be pushed up to 1600 ISO or more, and I loved the gritty, black and white images it produced – which were the only mono shots in the slideshows (remember slideshows?) that I used to present in those days. Sounds like something more from Victorian times, doesn’t it, rather than only a decade back. Agfa Scala film is no longer available of course, it was a relatively early casualty of the digital revolution – and to me, for quite sometime, it was the most serious of those casualties. But I no longer give slideshows, digital photography has opened up unimaginable creative possibilities – and there’s no doubt that the most successful road to black and white imagery is via full colour, Raw digital files and – for me at least – SEP2. So, a bit of a blast from the past I suppose, but I still remember Scala with a lot of affection. OM-4 with 75mm-150mm Zuiko; Agfa Scala monochrome slide, rated at 800 ISO; Silver Efex Pro 2, starting at the Strong Infrared Low Contrast preset.